Explore a World of Myth and Magic! RuneQuest: Roleplaying in Glorantha is a roleplaying game set in the world of Glorantha, a heroic fantasy setting rich in magic, mystery, and extraordinary adventure. The setting, Glorantha, is one of the oldest, most detailed, and most influential roleplaying settings ever published, and the rules are similarly acclaimed. Glorantha is filled with mortals and gods, myths and cults, monsters and heroes. The most powerful building blocks of the universe are the Runes, mystical symbols that permeate everything, and mastery of Runes allows astonishing feats of bravery and magic. This world is ancient and has known many ages, but now it is at the brink of the greatest conflict it has ever known… the Hero Wars! The RuneQuest: Roleplaying in Glorantha - Hardcover is now for sale! Mythic Adventure — RuneQuest began in Glorantha. It’s influences are Bronze Age cultures where the relationship between mortals and the gods are much stronger. Rather than being myths, the deeds and actions of the gods are history, and are very much active forces in shaping the day-to-day lives of all living things. Culture and Community — Adventurers are strongly tied to their cultures and clans, with compelling family histories, complete with all that entails. They begin play knowing not only who they are, who their family is, what clan they belong to, but with person al history that gives them experience and momentum going forward. Unique Adventurers — Players can create unique adventurers and customize them as desired, without arbitrary restrictions such as classes or levels. All adventurers can use magic, including powerful Rune spells that channel the very power of the gods. As adventurers progress, they grow along natural lines: skills that are used successful improve, and rather than being limited, the opportunities for development and improve increase dramatically. Dangerous Combat — Combat in RuneQuest can be dangerous, even deadly, with skirmishes filled the chance of fumbles, critical hits, and strategic tactical choices. Shields can shatter when hit hard enough, limbs can be disabled, and even the weakest of opponents can get off a lucky shot that can take out an experienced foe. RuneQuest’s percentile-based rules system has been used to drive many other wildly-successful games. including Stormbringer, ElfQuest, Ringworld, and most notably Call of Cthulhu, itself one of the most popular roleplaying games worldwide. RuneQuest's simple, intuitive system (also known as Basic Roleplaying) has directly inspired other games, including HeroQuest and King Arthur Pendragon, and been influential to countless other tabletop and computer games. 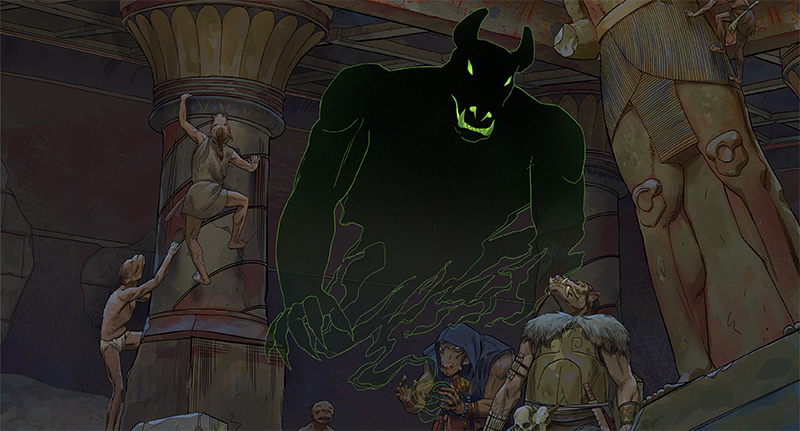 Whether you’re a longtime fan or someone interested in something new, now is the time to play RuneQuest. But beware of the Darkness below!